Each quarter, our Stillwater LCFS Quarterly Newsletter takes an in-depth look at one aspect of California’s Low Carbon Fuel Standard and other low carbon standard efforts around the country. In our latest LCFS Quarterly Newsletter, Leigh Noda analyzes the LCFS credit trends. The following is an excerpt from the latest Stillwater Quarterly LCFS Newsletter. 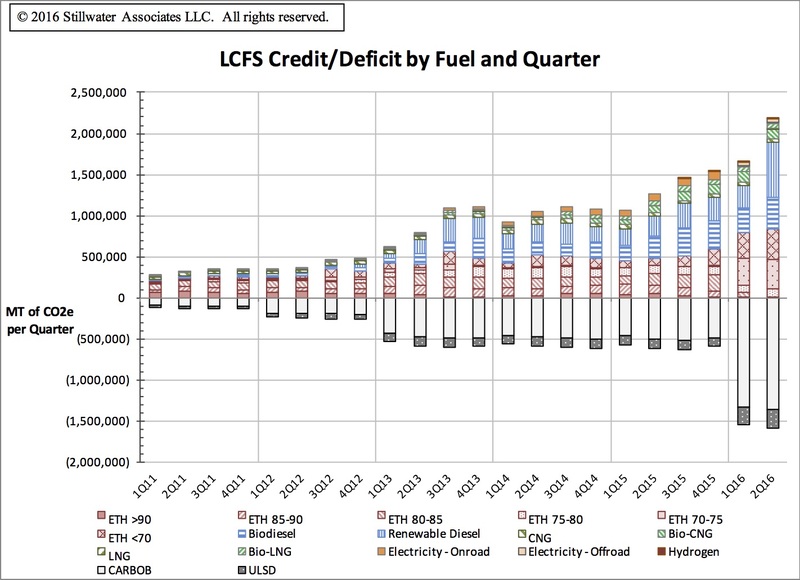 The credits and deficits by fuel category each quarter as reported by CARB are shown below. A large jump in the gasoline and diesel deficits due to the change in the standard in 2015 can be seen. The increase in deficits for 2016 is approximately 970,000 MT per quarter, 2.6 times the 2016 rate. A significant increase in credits is observed in the second quarter. The trends in credit generation by category shows the total credits generated increased significantly in the second quarter over the first quarter of 2016 and are significantly higher than the 1,533,000 MT fourth quarter of 2015, the previous highest credit generation quarter. For the second quarter renewable diesel credits increased, rising to 669,000 MT from 267,000 MT in the first quarter. This increase was the major driver in the banked credits for the quarter. An analysis of the data shows that the increase in credits was attributed to two things; an increase in volume of renewable diesel and a decrease in average CI renewable diesel for the quarter. Sign up for Stillwater’s LCFS Newsletter to read the entire analysis CARB’s Second Quarter 2016 LCFS Data.